This little guy might look cute, but one sneeze and you are toast. Send him flying from geocache to geocache to deliver friendly fire all over the world! 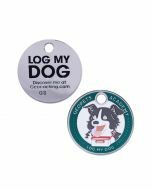 Available for a limited time, these trackable tags are a product of Oak Coins and include a metal chain for hitchhiking. They have a unique code and are trackable at Geocaching.com.